Despite the price of bitcoin still being down close to 50% since January 1st, 2018 has proven to be an extremely interesting year for cryptocurrency thus far. Dramatic volatility remains commonplace and market analysts remain baffled as to which direction prices will head next. Are we still in the bubble? Are we out of the bubble? For the coins and the companies which employ them that actually manage to achieve Satoshi Nakamoto’s vision of cryptocurrency being an easily-transferable, cost-reducing financial tool, the crypto bubble is over, and times are good. For the coins and businesses around those whose potential remains entirely speculative, times remain uncertain; and perhaps deservedly so, as the forces of capitalism might dictate. All in all, April was a kind month to cryptocurrency. The price of BTC climbed nearly $2,000 (or 30%) and the daily average of trading volume began to increase, after falling significantly throughout March. For the first monthly period the year has seen so far, bitcoin and many top alts demonstrated an uptrend, buoyed by an influx of institutional funds, which is a potential sign that Wall Street is once again ready to wet its beak in the pool of cryptocurrency. 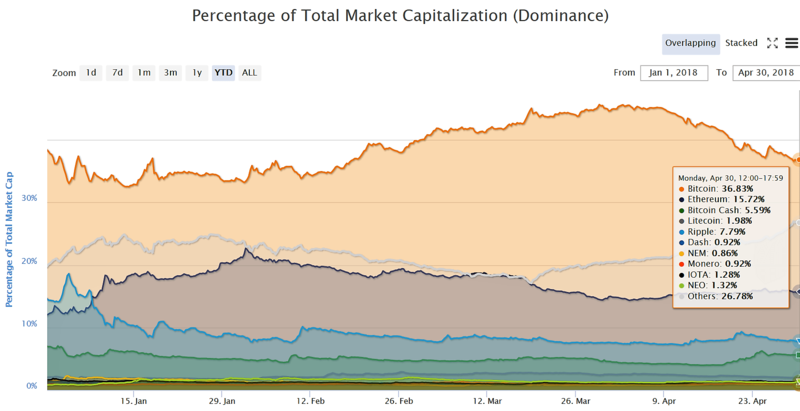 a decreasing percentage of bitcoin’s account for this total (Percentage of Total Market Capitalization) — as this is considered a sign of growing investor appetite for risk. Indeed, April witnessed both indicators come to fruition, perhaps acting as a definitive signal that blue (or green) skies were here once again for the future of cryptocurrency. The total coin market cap climbed nearly 70% in the last 30 days, from a miserable $263 billion on April 1st, to a triumphant $430 billion by April 30th. In the world of crypto, this is no small feat, and deep-pocketed investors have been taking notice. One of the biggest of such investors – none other than iconic wealth guru Warren Buffett – is still not sold on the idea of cryptocurrency. Over the weekend, he re-affirmed his conviction that crypto investments were purely speculative, telling Yahoo! Finance that buying cryptocurrency was simply not investing. The 87 year-old “Oracle of Omaha,” who is estimated to have a net worth of approximately $84 billion, has been a long-time opponent of bitcoin, dismissing it countless times over the last four years. “There’s nothing wrong with it,” said Buffett in a Friday interview. “If you wanna gamble, somebody else will come along and pay more money tomorrow. That’s one kind of game. But that is not investing.” Buffett’s words of wisdom should not be dismissed lightly, as it would be prudent to assume that he must have at least some idea of what he is talking about. Nevertheless, for long-time “HODLers” and those who just happened to buy in at any point earlier in the year alike, green flashes on the screen are always a welcoming sight, no matter the reason(s) behind why they are happening. A common misconception about bitcoin is that it is totally anonymous. For some reason this myth continues to flourish among the general public, who do not understand that by its very nature, the bitcoin blockchain ledger system is very transparent. Anybody can theoretically trace the origins and movement of every single satoshi of every bitcoin that has ever been created. This can be achieved through a combination of using a bitcoin block explorer and a newly-developing area of computer science known as blockchain or bitcoin forensics. While coin mixing or tumbling services are a fashionable way of obfuscating the ownership of bitcoin, transactions will always be linked to one another via information propagated and recorded by the bitcoin blockchain. What if it were possible for a blockchain to maintain an accurate ledger while stripping data associated with the origins of a cryptocurrency transaction? Enter: CryptoNote-based coins. The original CryptoNote coin, Bytecoin (BCN), an original take on the idea of the blockchain, was built from the ground-up, with enhanced user anonymity in mind. It became the basis for many other tremendously successful coins to follow, including Dash (DASH), DigitalNote (XDN), Boolberry (BBR), and perhaps most famously, Monero (XMR). Like most coins, Monero suffered from the usual problems at first: lack of user adoption, lack of a basic, functional wallet, and having to keep up with an ever-widening pack of competitors. Monero languished for years after its inception before suddenly exploding in value in mid-2016. In a period of less than a month, its price experienced a near 6-fold gain, from $2 a coin on August 14th, 2016 to over $13 a coin on September 10th. Growth since has been stupefying, with Monero currently trading at $239 per coin and sitting in the #12 spot of market cap value by coin. Monero peaked at $332 a coin in early March of this year, before beginning a spiraling down-slide from which it has yet to recover. Other illegal activity not necessarily linked to darknet markets, as former bitcoin-based criminals become more aware of the privacy limitations placed upon bitcoin transactions. Poloniex, the first cryptocurrency exchange to offer XMR-based trading pairs (and which was recently acquired by the Wall Street-backed payment processing giant Circle), announced over the weekend that it would no longer support Monero, its upcoming fork, or its signature XMR-based trading pairs. Perhaps due to Monero’s noted association with criminal and dark market-type activities, or perhaps due to the waning popularity of its original brand name, Polo’s decision to pull the plug on its long-time relationship with the CryptoNote-based coin will undoubtedly be an embittered divorce. As of early Monday morning, XMR was down close to 6% in the last 24 hours. Whistleblower data repository WikiLeaks might not have been successful without bitcoin, concludes Bitcoin Core developer Peter Todd. In a somewhat surprising outcome of events, a school district in the U.S. shells out big bucks in ransomware attack and actually gets its data back. The Roger Ver-owned bitcoin.com is once again the subject of controversy, as a Bitcoin Core contingency alleges the site is designed to trick users into thinking Bitcoin Cash is the “real” bitcoin (which is already impossible, given the simple fact that the symbol for Bitcoin is BTC and the symbol for Bitcoin Cash is BCH). The BTC vs. BCH controversy deepens as another debate ensues after a block explorer linking to a Bitcoin Cash explorer is removed from the Wikipedia entry for bitcoin.